Yes, Kunal bhai, you deserved all the swag that day! 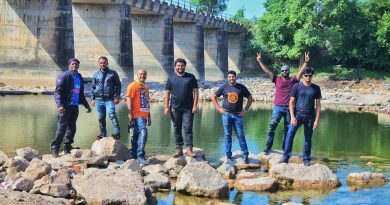 It was the start of 2017, the weather was just perfect for riding and that’s when our buddy Kunal bhai suggested doing a Just Ride to Dandiganahalli Dam. The concept of a Road Thrill Just Ride is just that. 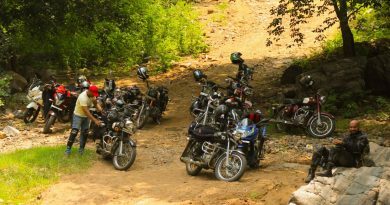 You feel like riding somewhere, you pitch the idea and whoever is interested, joins you. So when Kunal suggested this place and sent me a photo on WhatsApp, I was smitten instantly. The customary conversations and research later, it was confirmed; we would be riding. 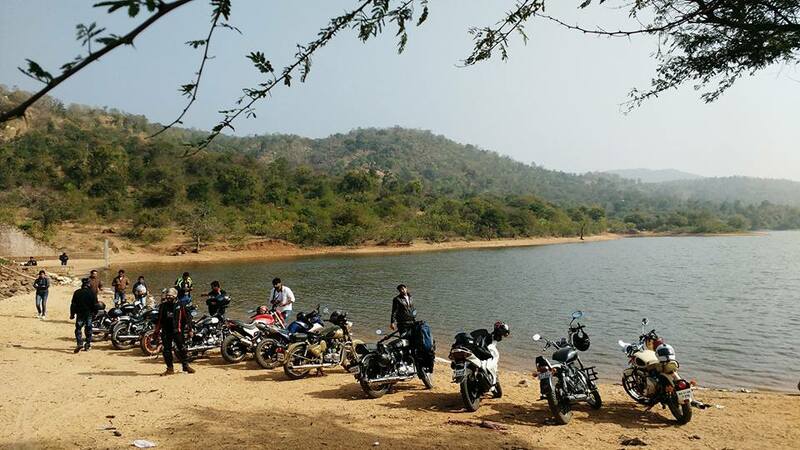 Dandiganahalli Dam is located off Chikkaballarpur and to get there involves a fair bit of off-roading, no-roading, village-roading…in short, uncomfortable riding. 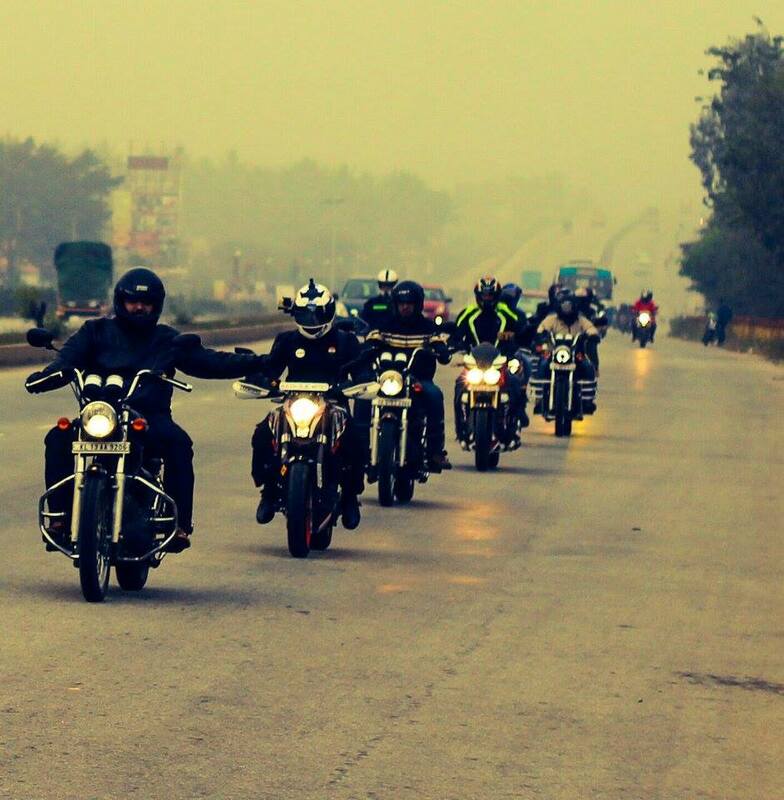 It was the 8th of January and Road Thrill Pune were to have their first ride on the same day. What better way to show solidarity with our brotherhood than by riding out ourselves? The starting point for our ride was opposite Esteem Mall, Hebbal. What was expected to be only four bikes became thirteen people! What a way to kick off the New Year! 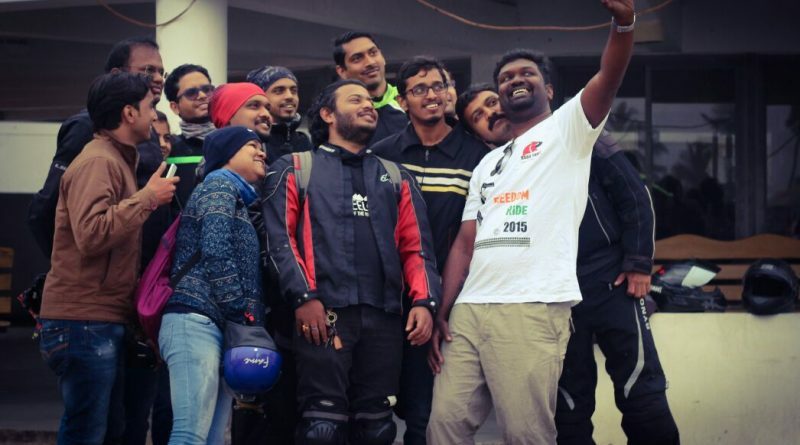 After all our riders had assembled, Kunal and myself conducted the briefing (yes it was my first time briefing a group before a ride and it was somewhat embarrassing) and we rode out in formation with Kunal leading. The sky had lightened up and the weather was quite chilly, despite our warm layers. Riding past Devanahalli, our marshal and chief-photographer-in-residence Vinod bhai pulls up to the ride captain and gestures to his helmet which I took to mean “We need a chai break.” Which we did, as some of us had left our homes really early and it was quite cold. We were doing good speeds so it was decided we would stop directly at Kamat’s for breakfast as the initial plan was. Kamat’s on Sundays is a hotbed of supercars and superbikes. The food isn’t quite what it used to be, but we were hungry and cold and gulped down whatever we could, to bring back some of the warmth to our bodies. 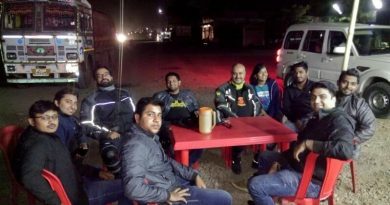 Our social media ninja JP bhai posted his groupfies on WhatsApp and we received a thumbs up from our Pune riders almost immediately. Stomachs full, we headed back the way we came, towards Chikkaballarpur. The highway soon gave way to small town roads, under construction roads, then village roads and soon, no roads. JP bhai was riding pillion with me and it was my first time off-roading, that too with a pillion, but I was managing pretty well. 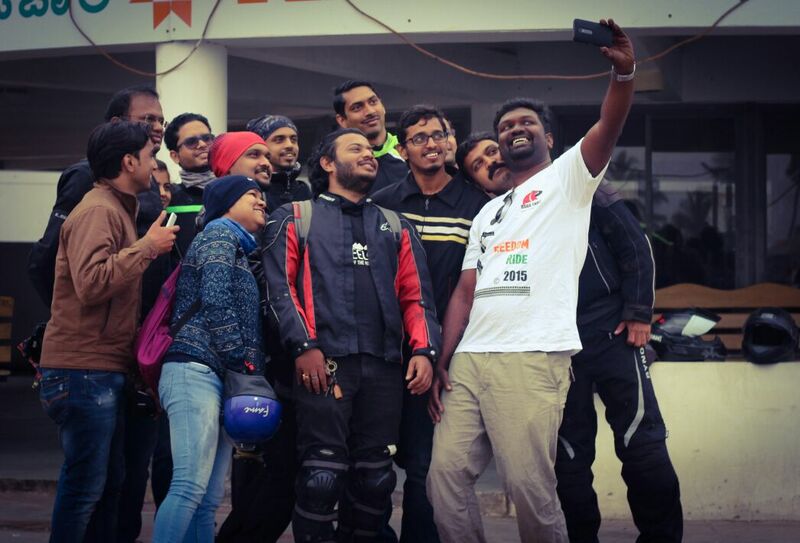 When we finally made it to Dandiganahalli Dam, we had a wide smile on our faces, the place was indeed worth it! After parking our bikes at the waterfront of Dandiganahalli Dam, we settled down under the shade of a tree, and JP bhai talked in detail about Road Thrill, how it started and what we had accomplished so far. This was followed by the introductions of our new members. Vinod bhai captured every moment beautifully with his lens. It was getting a bit warm and so we rode back out, through the same roads. Enough off roading for a day, for most of us! We dispersed at Devanahalli toll plaza and a few of us rode to Hebbal for lunch. Trust a Road Thrill member to know the best places to eat in town. The biryani and chicken I had was the best I have ever tasted in Bangalore! All that good food was making me drowsy and I had to pull over to the ORR service road, stop and take a power nap, twice. I made it home safely, with a wide smile on my face as usual after every ride. What a way to kick off 2017, Road Thrill with this ride to Dandiganahalli Dam! Lovely 🙂 How about this Sunday again to somewhere just like the last time??? ?